ON THE WRONG SIDE OF THE LEAF! I know we can get up on the wrong side of the bed, we can also drive on the wrong side of the road. I always say I am on the wrong side of the camera if it is pointed at me. I am left-handed and so I am on the right side of my brain most of the time. Are you? 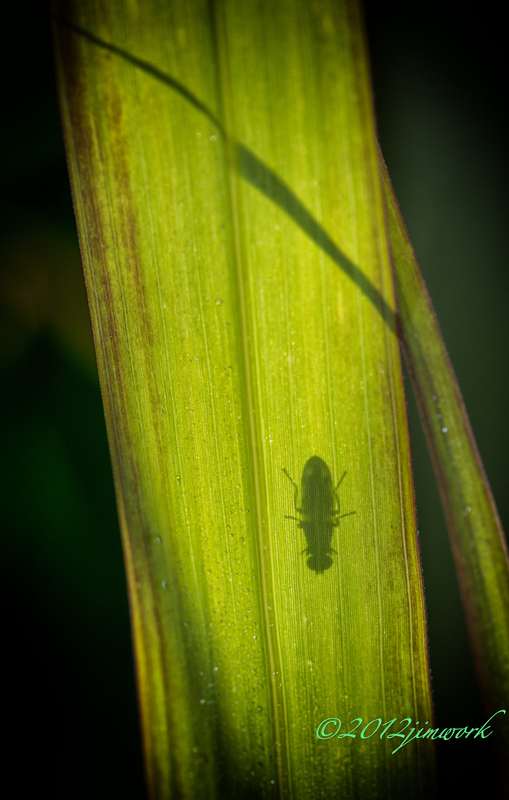 I found this unidentified insect perched on this blade of reed grass. I wanted to try and see what kind of bug it was, but I was blocked by the fact there was a yucky (a real scientific term) large puddle on the sunny side of the leaf. I was seemingly stuck on the wrong side of the leaf! But the more I pondered my view, I was only on the wrong side of one view, I had a marvelous view from where I was, right or wrong? awesome picture with a great little story to go with it. I agree, we can sometimes feel like things aren’t going just how we plan, but we just need to enjoy where we are.